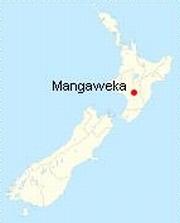 Mangaweka is a township on State Highway One (SH1), in the North Island of New Zealand, with a population of over 200. It is between Taihape to the north and Hunterville to the south. The township is interesting not only for the visually interesting historic main street, but also because of its growing artists' community. The main street is preserved in its original state due to SH1 being re-located in the early 1980s. This tore the heart out of the township as the main street became redundant, but this is what makes the township such a tourist attraction today, with many people stopping to take photographs and visit the flourishing art galleries. 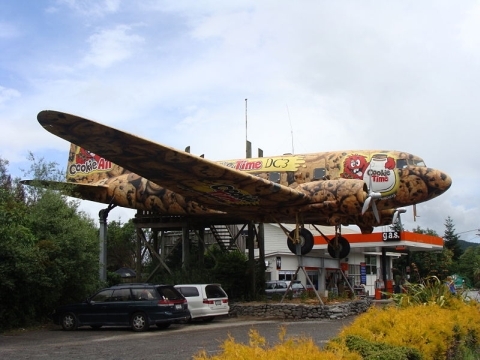 Other features in the township are a cafe in an elevated DC-3 aircraft, a busy river rafting centre, fishing and walks along the former North Island Main Trunk railway line and tunnels, replaced by a deviation in 1981. Famous (or infamous) people who have lived in Mangaweka include the New Zealand poet Sam Hunt, the artist Robin White (whose iconic "Mangaweka" painting hangs in Te Papa) and photographer/artist Richard Aslett. The town also hosts the controversial annual "Fakes & Forgeries Art Exhibition and Festival" in October and November, which in 2007 featured Mangaweka's most famous son, C. F. Goldie (alias Karl Sim). Other major features close to the town include one of the country's biggest railway viaducts, Makohine Viaduct, and the enormous Papa cliffs that follow the Rangitikei River canyon, providing the setting for the southern hemisphere's highest flying fox and bungy jump.